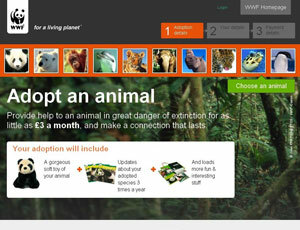 WWF-UK launched a microsite, www.wwf.org.uk/adoption, in September 2009 with the intention of significantly increasing the proportion of visitors who become donors and supporters. Although the existing WWF-UK website had attracted visitors, the organisation felt improvements could be made in securing donations. Online is a vital channel for WWF, with 60 per cent of its new supporters now joining via the internet. One of the objectives of the microsite was to boost the take-up of animal adoptions. The website was developed within 13 weeks of the WWF briefing the two agencies involved: the web design agency Torchbox and the programming agency Codestorm. Though the new website functions separately from the WWF's main site, it shares the same design, look and feel, so users experience consistency. The new site is also self-contained, which means the opportunities for potential donors to leave the site before donating are minimised. The site also includes supporter testimonials. It has a one-off payment option for the adoption pages, which has boosted order values by 10 per cent. The conversion rate of online visitors to the WWF adoption site increased from 5 per cent of visitors to the old WWF site in August 2009 to 16 per cent in December 2009. Although the charity acknowledges that this increase could have been down to the Christmas period, conversion rates for the first quarter of 2010 stood at 10 per cent, double the rate reported for the first three months of 2009. From September 2009 to May 2010, more than 50,000 adoptions were received through the site, with a total annual value of £3m per year - this compared with 35,000 orders, with an annual value of £2m, in the same period the year before. 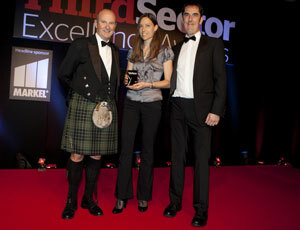 Leah Williams, community and social media manager at Breast Cancer Care and a judge for this award, said: "The standard of entries was very high, but the WWF entry stood out. It was nicely laid out, it was clear, easy to use and included good background information."